LOM architecture and design, FDP’s sister company, has unveiled its new tech campus for RocketSpace, designed specifically for high-growth tech start-up businesses. RocketSpace, whose alumni include Uber, Blippar and Spotify, has been home to 18 Unicorn (billion dollar) companies from their San Francisco-based HQ. 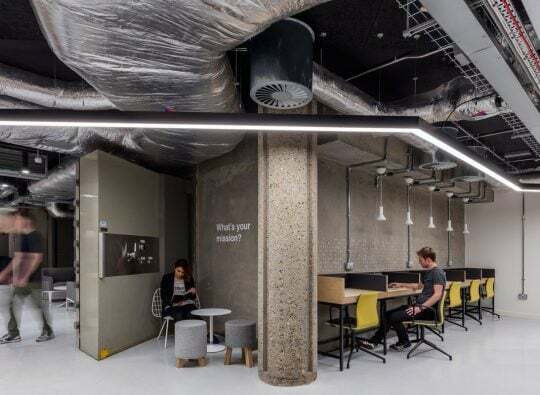 The fit-out and restoration at Regents House in Angel, north London, designed by LOM, provides RocketSpace with flexible working spaces for up to 1,500 as the organisation continues its ambitious growth and builds a global network of campuses. The London campus, launched in May 2017, is the first beyond San Francisco – the result of a successful partnership between RocketSpace and NatWest. Initially set over three floors, including a former underground bank vault, LOM’s design strips back the 1980s building to its original shell revealing the structural core of blast proof reinforced concrete, intricate webs of coffered ceilings, and brickwork. Core structures are complemented with a utilitarian approach to the workplace design. Exposed services, clean lines and metallic colours provide a backdrop to an array of exciting brand messaging and wayfinding, giving spaces individuality and character. Upper floors of the campus provide dedicated co-working surf desks and a range of 4-30 person suites for tech start-ups, designed to expand flexibly in response to business growth. An impressive double height basement space, retaining the original bullion storage vault, provides a shared social, interactive networking hub and event space with bleacher seating, teaching facilities, media pods a bar area, and meeting rooms. A full height south facing glass façade with bi-folding doors replaces heavy security shutters to provide natural light and access to an outside landscaped yard. Within the bank vault is a ‘villain’s lair’ themed games room and lounge complete with bullion cages and bank vault doors.